Mothers many times worry when their children appear to have a rise in temperature, are unable to play, cranky, restless and more are told they do not have to go to the hospital all the time they spot a change. However, you need to worry and call your paediatrician right away if you notice any of the signs below! Baby’s temperature: It is important to have a personal digital thermometer so you can check not just for a fever but an abnormally low temperature. Once thermometer reading is above 380c or below 35.50c especially in a baby less than 3 months old, call your paediatrician immediately. Dehydration: This happens when your baby is not getting enough fluids, not breastfeeding or ill. If your baby’s lips and mouth are dry, if the baby is very restless and not sleeping; and if babies’ diaper did not get wet at all throughout the whole day, go straight to the hospital. Poor appetite and Pooping: If your babies sucking appears to become weaker, slower and feeds less than usual within a 24-hour period, that is a sign not to ignore. For a baby who has not pooped, has whitish mucus or red in the stool, check with your doctor. 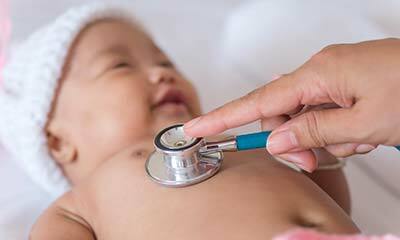 Breathing abnormally: Check for very fast breathing in your baby, normal breathing rate is 60 breaths per minute. If it appears faster than this and your baby is making audible grunting noises, breathing looks very difficult for him, his nostrils look flared and he is highly uncomfortable, don’t wait! Go straight to the children’s emergency section of your hospital. Skin Color: A sign never to joke with is an appearance of blueness or paleness in your babies skin! If you notice babies eyes, chest, abdomen, arms, or legs appear yellow. Never forget to always check the umbilical stump if it is yet to fall off for any discolouration, odour, pus, or persistent bleeding which could be a sign of infection, don’t manage at home, take your baby straight to the hospital!